Hi friends! I hope you're having a great day! We are doing pretty good around here. We are trying to take it easy a bit and trying to get things done. Also, can you believe that it's almost fall? I guess it might be fall in some parts of the country. This year has gone by SO fast! Speaking of getting things done, one of my friends asked me to make baby shower invites for one of our mutual friends. The theme of the baby's nursery is sailboats. I was sent a picture of the bedding and based my card on that. However, this is the second draft I made. I will share the first card I made on another day. This card ended up with a lot more steps than I originally intended. I don't know how the card LOOKS so simple yet was so labor intensive. I used A LOT of Spellbinders on this card. Fussy cutting. Dry embossing. 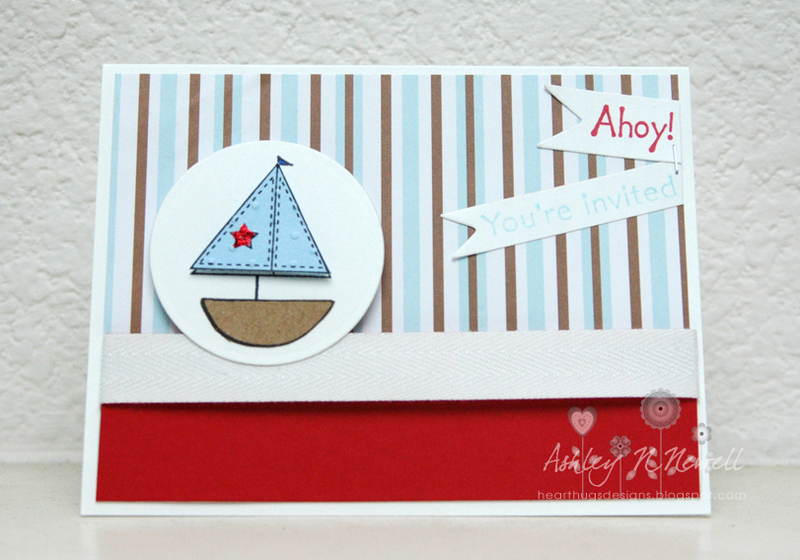 The boat and "ahoy" is from an old Gina K Stamps set from Tami Mayberry. The paper is from Recollections called something like Baby Boy Stripes. I need something I could buy a lot of and quickly. The "you're invited" is from Stampin Up, an even older set. I added some May Arts ribbon, a Tiny Attacher staple, some Stickles, and I pulled out my old Swiss Dots embossing folder. So, this is the card from lots of past things. And here's a picture of them all on my desk drying. All 30. It took me about 10 hours. You are the sweetest friend to make these! They turned out great! Very cute! I made invitations for my son's birthday recently and they are way less involved than these but probably took me the same amount of time, lol.